Physiotherapy and Wellbeing Every physiotherapy assessment begins with a subjective analysis, where we find out what your physical limitations are and how your pain behaves. The 24 hour pattern of your pain guides the physical examination. 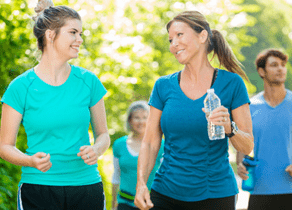 Physical limitations may impact on your social activities such as sports teams or walking groups, which in turn can effect your mental wellbeing through reduced social involvement as well as physical disorder. Don’t let your mindset believe that pain is something you have to live with. PhysioFITT is a new initiative that aims to provide a pathway to physical activity for those who think getting started if too big a obstacle to overcome by themselves. PhysioFITT provides an initial step toward physical activity, and will involve on-going support to become and then maintain a level of physical activity that is personally sustainable. Our programs are tailored to you personally. You don’t need a doctors referral to get started but please feel free to ask your GP if PhysioFITT is suitable for you.